Sony's second Android tablet intrigued us. 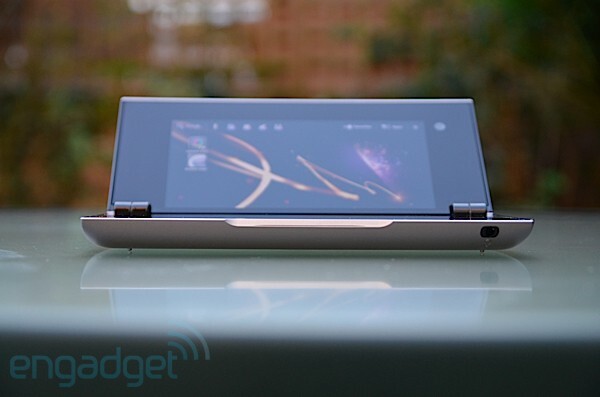 We're always willing to give another form factor a try and in the Tablet P (£500), we certainly had that. While the Tablet S's wedge profile stood it out a little from the rest of the prone slabs, the P piqued our interest with an unusual clamshell form factor. Once the two 5.5-inch screens are folded together, the tablet has a pretty tiny footprint and just about fits into a jacket pocket. It's the third PlayStation-certified device, arriving proudly emblazoned with the four symbol trademark, and a second screen capable of doubling-up as both a controller for games or as a laptop-style keyboard. However, those twin screens require some not-so cosmetic adjustments to the Honeycomb experience we're used to and this is where we're most interested in seeing how Sony fared. Is the unique design implemented well enough? How does it fare as a games machine? Can a clamshell pull potential tablet buyers away from the iPad and a legion of sameish Android tablets? Crack open our review to find the answer to those questions and much more. How would you rate the Tablet P? 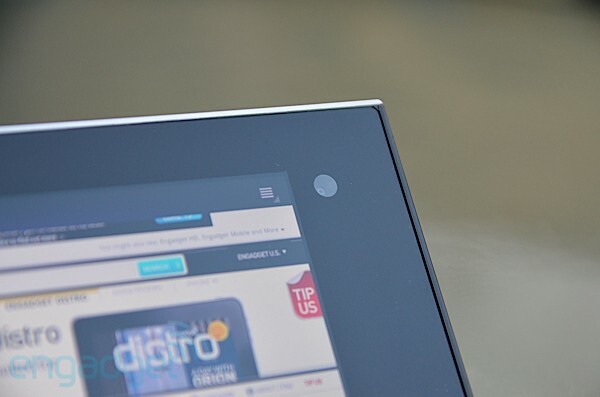 Even from a distance, the Tablet P isn't going to be confused for another Android gadget. Removable silver plastic sheets cover the front and back -- a shame that Sony's design team didn't decide to follow on with the glossy black finish found on the ends and the hinge. Although the matte finish copes better with fingerprints, scratches still easily break the surface. The body itself is feels solid, largely thanks to its chunky profile, although those covers do creak a little. The Tablet P weighs in at 0.37kgs (0.82 pounds), making it slightly lighter than comparable 7-inch tablets, with its unusual form factor distributing the weight in a way that never felt unwieldy. It also helps that the folding design means you can prop it up on any flat surface. Along the narrow right edge, there is a micro-USB socket and a dedicated AC port, which worked fine with our PSP adapter. A fiddly volume rocker's also made its home here, next to the mic, with a single speaker located on the opposite edge. Yes, a single speaker. Unfortunately, the sound quality is hugely disappointing -- especially given how impressed we were with the PlayStation Vita's audio prowess. The Tablet P gives out some of the weediest, tinniest sound we've heard on a tablet; if you're looking give your media a public showing, then you'll have to crank up the rocker to the max. 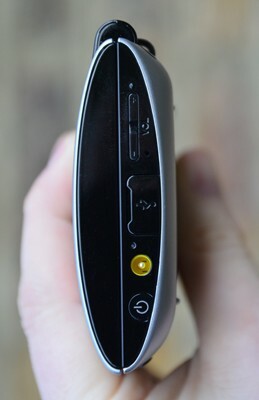 The removable plastic shell gives access to the SIM card on the top, and the battery and microSD card below. Yes, it's microSD, not the full-sized card we were told to expect. The hinges protrude from the back, but are designed in a way to bring the two halves as close together as possible once the device is opened for use. After doing so, you'lll find two two sheer black surfaces reflecting back at you. The only undulations here are the front-facing VGA camera and a slight nub on the lower edge -- something for your fingers to grip at to open and also the placement of the notification light, which acts similarly to the Sony Ericsson Xperia Ray. It will emit a green hue when emails and social network notifications arrive, while a troubled red-orange hue appears when the device is getting short on battery life. The pair of 5.5-inch screens are identical. Both of the 1,024 x 480 screens have Sony's TruBlack LCD technology, promising deeper darks and brighter whites, and it gives a respectable performance. Dual AMOLED would have been nicer, and if the 5.3-inch Galaxy Note can manage it, what's in an extra 0.2 inches? Viewing angles are passable, although in comparison to the PlayStation Vita, possibly the pinnacle of Sony's portable screen technology so far, they're certainly not the greatest. There's a blueish hue given off by the screens at indirect angles. Fortunately, by the sheer virtue of it the clamshell, you don't have to fear that the (non-Gorilla Glass) screen will come to much harm, unlike its sister, the Tablet S. The P also differs from its sibling in that it comes without an IR emitter, which is a shame, given its portable size. We also found that our UK review unit had a lot of issues maintaining WiFi reception -- typically one or two bars less than other nearby wireless devices -- although we didn't seem to have the same problems with a Japanese retail model. The front-facing VGA camera does its job for obligatory self-portraits and it keeps the possibility of video chat open -- Sony has made its own videochat app for this. On the back, you'll find a five-megapixel auto-focus camera. Admittedly, it's still not the greatest shooter to grace a tablet, but given the meager sensors found on some of the leading slates, this is an admirable effort from Sony. You'll find results are quite muted, and low-light conditions often added a fare dose of noise to our shots. Video capture performance is less that stellar. Our recording below shows that there's more auto-focus in action here, once it hones in on a target. The camera is capable of shooting 720p resolution video, though this isn't clear from when you start filming; instead, you get the choice of high, medium and low quality footage. Again, low lighting is not your friend here; you'll need to be in a well-lit room or outdoors to get any good shots from the camera. Two screens will take a toll on any portable device, and we were glad to see a 3,080mAh battery here. 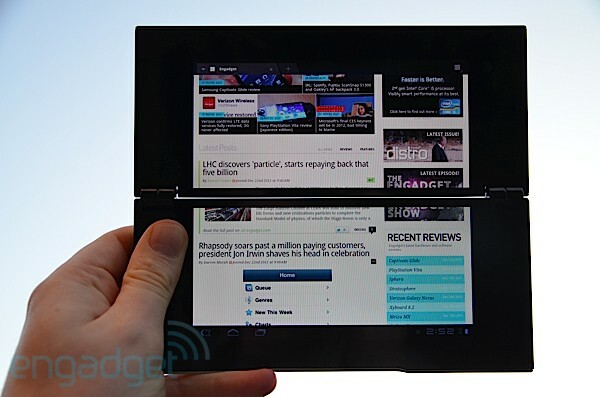 However, Sony could have tinkered with how the Tablet P deals with those two screens. Video playback from both files and websites can be split between the two screens -- with that jarring bevel cutting it in two -- or it can be assigned to the top screen only. However, the lower screen doesn't time out; it stays on needlessly draining precious juice from the battery. Our video rundown test at 50 percent brightness still managed to last six hours and fifty minutes. Not the greatest showing, but we can't help but be ever-so slightly impressed by its battery lap time, given the inefficient two-screen setup. The Tablet P totes a dual-core processor, clocked at 1GHz and 1GB of memory. Compare the clamshelled Android against similarly small-screened competitors, and the dual-core processors perform as expected, with the slightly faster clocked Galaxy Tab 7.0 Plus besting the Tablet P's efforts. However, Sony had to tinker pretty heavily with Android Honeycomb 3.2 -- a necessity given the unusual hardware -- though ironically, that re-tooling seems to have taken its toll on usability. The screen response isn't all that nimble, so transplanting icons and widgets between both the two physical screens and home pages is erratic, bordering on frustrating. However, apps still manage to load pretty swiftly and we were particularly impressed with the smoothness of the web browser. As we mentioned earlier, Sony had to meddle with the stock Honeycomb experience to get it to work with the P's dual displays. This includes a new launcher along the top of the screen. Alongside the stock Google search box, you'll find shortcuts to mail, a social feed hub and video content. Next to the app drop-down menu in the top right corner, there's also a favorites shortcut, providing a glossy UI to all your Sony-bought content and self-made videos. The app menu has also been given a white coat of paint, and icons will occasionally glimmer. Of these, most third-party apps won't fill out the two screens. A handful, however, have been crafted for the Tablet P. The stock web browser rolls smoothly between the two screens, with the second screen taking responsibility for the keyboard input when necessary. It's here where the dual-screen setup shines. While the bezel between them may jar a little, pages load swiftly (if the device manages to hold onto a wireless signal) and Flash content loads untroubled, as long as you don't force it to fit one or both screens. Cassandra acts as a clock stand function for the Tablet P and will display you the time, local weather forecast and a handful of news headlines. It'll also ignore your display timeout settings. Crackle offers up some free streaming media content, a pretty random selection of movies and TV shows to stream for free. Thankfully, there were several familiar titles within the Crackle vaults. Cooklet showcases a selection of recipes with details on preparation and a smattering of social media features. It's a good showcase of how apps could should make the most of the Tablet P's hardware -- and makes all the other non-optimized apps such a disappointment. While the Tablet P often gives you single and full-screen options, most app will remain trapped on the top screen and crash at the mere mention of full-screen. The majority of Google's own apps are present, though for some reason YouTube is absent. Both Music Unlimited and Video Unlimited, Sony's attempts at hawking content to its devices, are pre-installed here, although we can't say we found using them the easiest experience in the world. You'll find yourself updating the apps, logging in, logging in again, downloading a free trial app, and generally being sent on a convoluted route to content that's often better provisioned elsewhere. Factor in the need to factory reset the device twice during our efforts, and you can guess what we generally think about it. If you manage to persevere, you'll gain access to around 10 million songs. Sony hopes to win you over with two different usage plans -- a familiar-sounding basic one that will sync your music collection, and a premium plan offering any tune from its song library on demand. The video counterpart is stocked with the same sort of mainstream fare you'll find in other media libraries, with recent releases available to rent or buy. The good part; this content will play on just the top screen, with the control panel lower screen timing out to save battery life. The Tablet P is also DLNA-compatible, and more than willing to share whatever you do buy on bigger screens -- and better sound systems. Sony still hasn't really galvanized the game selection since the Tablet S. Fortunately, Sony was running a festive game promotion when we got our hands on the clamshell model, though the selection remained particularly underwhelming, free or not. It's worrying when the oft-maligned game selection of the Xperia Play trumps what we get here. 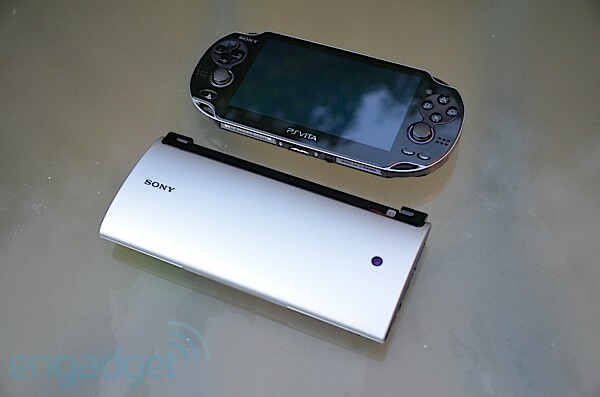 Games play similarly to the Tablet S, with the ability to reassign (and re-size) the location of those familiar PlayStation gaming buttons to suit. This is a clever tweak, providing an adjustable controller that can adapt to your own hands -- and bring those pesky collar buttons into use. Despite this, it doesn't quite match the fast-twitch response of the physical controls afforded on both the Vita and Xperia Play, but for the likes of Kula World and Crash Bandicoot, they're up to the task. We'd probably avoid the driving titles, though. Despite a premium price tag that pits it against the iPad, it doesn't follow up with a commensurate user experience. We were intrigued as to how Sony was going to pull off the two-screen setup. The quality of the build is a mixed bag, however, and while we like the black shiny look and feel of the tablet, the flimsy covers are pedestrian, at best. We've seen several phones attempt to break the general trend for a full-sized single panes and like we saw there, the problem remains that the Android OS hasn't been built for anything different than the single screen. This means that, despite Sony's efforts to create a few dedicated apps, the lower screen generally goes unused and unloved. We're also baffled as to why there's not even a single-screen version for major apps like YouTube. All told, despite a premium price tag that pits it against the iPad, it doesn't follow up with a commensurate user experience. Screen transitions are sluggish, and that bezel (perhaps unsurprisingly) often hinders any interactions between the screens. Priced at £500 ($780), the portability of the device may find some fans, but your money would be better spent on either a smartphone with similar screen real estate, or sacrificing that portability for a more app-friendly tablet.